Pranimita, R., Hoondee, P., Tanasupawat, S., and Savarajara, A. (2019). "Hydrolysate from phosphate supplemented sugarcane leaves for enhanced oil accumulation in Candida sp. NG17," BioRes. 14(1), 1014-1032. The objective was to identify yeast NG17, a newly isolated oleaginous yeast obtained from soil in Thailand and to characterize its oil yield and composition in sugarcane leaves hydrolysate (SLH), a sustainable resource. Biochemical and phylogenetic approaches were used to characterize yeast NG17, and its lipid content was determined by gas chromatography. Yeast NG17 was placed in the genus Candida, but not identified to species. It had an oil content of 27.9% (w/w, dry weight) with a major fatty acid composition of oleic (57.6%) and palmitic (25.4%) acids when grown in a high carbon/nitrogen (C/N) ratio medium for 6 d. The oil yield of Candida sp. NG17 was 2.3 g/L when grown in SLH, which contained 18.7 and 19.1 g/L glucose and xylose, respectively, without any supplementation. Meanwhile, the oleic and palmitic acid composition of the oil was reduced to 48.5% and 22.1%, respectively. The oil yield obtained in SLH was higher than that in the detoxified SLH (2.1 g/L). Increasing the SLH pH to 6.5 resulted in an increased oil yield to 5.07 g/L. Supplementation of SLH (pH 6.5) with 0.1% (w/v) KH2PO4 further increased the oil yield of Candida sp. NG17 to 6.67 g/L. Overall, Candida sp. NG17 is a good source of oil for renewable oleochemicals and biodiesel production. Under an excess of carbon but in a nitrogen-limited condition, some yeasts accumulate high intracellular lipid levels as an oil droplet covered by a phospholipid monolayer (Ageitos et al. 2011). The accumulated oil is mostly in the form of triacylglycerols (TAGs) (Sitepu et al. 2014). In the presence of excess carbon when the nitrogen is exhausted, lipid synthesis is triggered by the decreased level of AMP, which leads to an increased level of isocitrate. The isocitrate is then converted to citrate, exported into the cytoplasm, and converted to acetyl-CoA, thereby entering the lipid biosynthetic pathway. The TAGs are formed by the Kennedy pathway, where in brief glycerol-3-phosphate is consecutively acylated by 3 acyltransferases and dephosphorylated by phosphatases (Ageitos et al. 2011). Yeasts that accumulate intracellular oil to more than 20% (w/w, dry weight; DW) are defined as oleaginous (Ratledge 1989). The differences in the oil accumulation and fatty acid composition between yeasts have been reported to be strain-specific (Sitepu et al. 2013), which highlights the importance of screening for novel oleaginous yeast strains that are substrate-specific (Agetos et al. 2011). Yeast oil is currently viewed as a valuable potential alternative resource for high-value fats, renewable oleochemicals, and biodiesel (Wang et al. 2018). Candida krusei was found to produce palmitoleic acid (C16:1) at 430 mg/g DW when grown in medium containing a C/N ratio of 30 and a carbon/phosphorous ratio of 6 (Kolouchová et al. 2016). Palmitoleic acid has several applications in medicine and cosmetics, such as reducing the total and low-density lipoprotein cholesterol serum levels (Griel et al. 2008), preventing β-cell apoptosis (Morgan and Dhayal 2010), healing and acting as an anti-inflammation agent in damaged skin (Gao et al. 2003), inhibiting the growth of Gram-positive bacteria (Wille and Kydonieus 2003), and providing increased skin resistance to solar radiation (Hayashi et al. 2003). Yeast oil typically has a high ratio of C16 and C18 fatty acids, similar to plant oils, which is a favorable fatty acid composition as a raw material for biodiesel production (Kolouchova et al. 2016). However, oil production from yeast has advantages over that from plants, such as it does not require a large plantation area, has no limitation based on topography or season, and has a 100-fold higher oil productivity. The yeasts can utilize various kinds of simple sugars, including those derived from lignocellulose (Atabani et al. 2012). Thus, oil production by yeasts for subsequent biodiesel production is also of interest, especially if they can use sustainably renewable non-food feedstocks, such as waste lignocellulose products. Dilute acid hydrolysis is probably the most favorable method to solubilize and convert the hemicellulose fraction of lignocellulose to fermentable sugars and to make the cellulose fraction accessible to enzymes (Alvira et al. 2010). The method gives high xylan to xylose conversion yields, which increases the overall economic viability of the process, because xylan accounts for up to a third of the total carbohydrate in many lignocellulosic biomasses (Sun and Cheng 2002). However, the dilute acid hydrolysis method also generates degradation products, such as furfural and hydroxymethyl furfural (HMF), which have negative effects on the downstream process compared to the use of concentrated acid hydrolysis (Alvira et al. 2010). Detoxification of the lignocellulosic hydrolysate by Ca(OH)2 (overliming) has emerged as one of the most efficient methods to avoid the problems caused by the degradation products. Overliming of the lignocellulosic hydrolysate obtained from sulphuric acid (H2SO4)-mediated hydrolysis results in CaSO4 precipitation (gypsum), which keeps the level of soluble salts in the hydrolysate at a low level, which is more favorable for the subsequent fermentation process (Jonsson et al. 2013). However, overliming can also deplete the soluble phosphate levels through precipitation of calcium phosphate. Recently, the conversion of sugars derived from the dilute acid-treated lignocellulose hydrolysate into yeast oils has been reported. Trichosporon sp. grown in 1% (w/v) H2SO4-treated sugarcane bagasse hydrolysate, containing 8% (w/v) sugar, and detoxified by 2% (w/v) activated charcoal at 30 ºC for 120 h, produced 10.25 g/L oil. The major fatty acids of the oil were oleic (C18:1, 54.7%), palmitic (C16:0, 22.8%), and stearic (C18:0, 10.4%) acids (Brar et al. 2017). The oil obtained from the cultivation of Rhodotorula glutinis at 30 oC in corncob hydrolysate (CCH) treated with 0.5% (w/v) H2SO4 and 1.5% (w/v) phosphoric acid and then supplemented with 4 g/L (NH4)2SO4, 6 g/L KH2PO4, 2 g/L Na2HPO4, 2 g/L MgSO4, 0.1 g/L CaCl2, 0.12 g/L FeCl3 (pH 6.0), for 79 h at 180 rpm and 30 ºC was 3.41 g/L. Oleic (C18:1, 46.9%), palmitic (C16:0, 33.1%), and linoleic (C18:2, 14.3%) acids were the dominant fatty acids in that oil (Liu et al. 2015). Tampitak et al. (2015) used 20 g/L of sugar, derived from the hydrolysis of the residual solids of palm empty fruit bunch, which had been obtained from the 10% (w/v) sodium hydroxide delignification and then hydrolysis at 0.5% (w/v) with 2.5% (w/v) H2SO4, as a carbon source for growing the oleaginous Candida tropicalis X37. When the medium was supplemented with 2 g/L (NH4)2SO4, 0.2 g/L MgSO4.7H2O, 0.5 g/L KH2PO4, 0.1 g/L CaCl2.2H2O, a yield of 2.73 g/L of oil was obtained after culturing for 72 h at 30 ºC with agitation at 140 rpm. The major fatty acid composition of the oil was palmitic (C16:0), oleic (C18:1) and linoleic (C18:2) acids. Thailand is the second largest exporter of cane sugar and, for example, produced 100 million tons of sugarcane on 11 million rai (17,600 km2) of plantation area in 2016 (Office of the Cane and Sugar Board 2017). Approximately 250 kg of sugarcane leaves are obtained per rai of sugarcane, but these are mainly burnt to ease harvesting of the cane. This wastes their biomass energy value and creates air pollution that has an adverse effect on animal respiratory systems (Cancado et al. 2006). Consequently, it is economically and environmentally beneficial to create value for sugarcane leaves, which are a rich lignocellulose source. The acid-pretreatment of sugarcane leaves at 6% (w/v) with 1.5% (w/v) H2SO4 at 121 °C and 103 kPa for 30 min, followed by treatment of the obtained slurry at pH 5.0 with cellulase (160 FPU/g DW) at 50 °C for 6 h, yielded 9.8 g/L glucose and 9.0 g/L xylose from the obtained sugarcane leaves hydrolysate (SLH) (Jutakanoke et al. 2012). The objective of this work was to identify the newly isolated oleaginous yeast NG17, determine the fatty acid composition of its accumulated oil and maximize the oil production using SLH as the raw material. The sugarcane leaves (Saccharum officinarum L.C SB06-2-15) were obtained from the Sugarcane and Sugar Industry Promotion Center, Region 3 (Si Racha district, Chonburi province, Thailand). They were dried at 60 °C to a constant weight and then hammer milled and sieved to obtain a 20- to 40-mesh particle size. The chemical composition of the sugarcane leaves, which was determined according to TAPPI T211 om-12 (2012), TAPPI T222 om-15 (2015), and TAPPI T203 cm-09 (2009) methods, is summarized in Table 1. Oleaginous yeast NG17 was selected for the highest oil production from 106 yeasts isolated from soil, water, plant debris and insect frass samples collected from Ranong province, Thailand. When grown in a high C/N medium (pH 5.5), containing 5% (w/v) glucose, 0.01% (w/v) yeast extract, 0.01% (w/v) (NH4)2SO4, 0.05% (w/v) MgSO4·7H2O, 0.01% (w/v) NaCl and 0.01% (w/v) CaCl2 (modified from Tanimura et al. 2014) at 30 °C and 200 rpm for 6 d, it had an oil an oil content of 27.9% (w/w, DW). Cells grown in YM broth for 3 d were used for microscopic observation. The morphology of colonies grown on 5% (w/v) malt extract agar for 7 d was examined by naked eyes. The formation of pseudohypha and true hyphae were examined by the slide culture technique on cells grown on corn meal agar for 7 d. Ascospore formation was examined on YM agar and 5% (w/v) malt extract agar for colonies grown up to 30 d. Carbon assimilation was examined in liquid medium, whereas nitrogen assimilation and urease activity were performed on solid medium. The ability to grow at various temperatures was determined in YM broth. All other incubations were at 25 ºC. Genomic (g) DNA of yeast NG17 was extracted as reported (Endoh et al. 2008). In brief, yeast NG17 grown in YM broth was boiled in lysis solution (0.1 M Tris buffer, 0.03 M ethylenediaminetetraacetic acid, 0.5% (w/v) dodecyl sodium sulfate) for 15 min, mixed with an equal volume of 2.5 M potassium acetate and then kept at 4 °C for 60 min. After centrifugation, the supernatant was subjected to chloroform/isoamyl alcohol extraction, and then the gDNA was precipitated by isopropanol. The obtained DNA was sequential washed with 70% and 99.8% (v/v) ethanol, air dried at 37 °C, and dissolved in distilled water. The extracted gDNA was polymerase chain reaction (PCR)-amplified for the 26S rDNA (D1/D2 domain) using the NL1 (5’-GCATATCAATAAGCGGAGGAAAAG-3) and NL4 (5’-GGTCCGTGTTTCAAGAC GG-3) primers (Kurtzman and Robnett 2003). Thermal cycling was performed at 94 °C for 3 min, followed by 36 cycles at 94 °C for 30 s, 52 °C for 30 s and 72 °C for 30 s, and then a final cycle at 72 °C for 5 min. The PCR product was purified using a GenepHlowTM PCR cleanup kit (Geneaid, New Taipei City, Taiwan) and commercially direct sequenced at Bioneer Corporation (Daejeon, South Korea). The DNA sequence data was manually edited using the Bioedit version 7.2.5 program (Ibis Therapeutics, Carlsbad, CA, USA) (Hall 1999). Molecular operational taxonomic unit (MOTU) identification was performed by comparing the obtained sequence with the sequences available in the DDBJ/EMBL/ GenBank database using the BLASTn program. Homologous sequences were downloaded and multiple sequences aligned by MUSCLE (Edgar 2004). Then, a phylogenetic tree was constructed using neighbor-joining (NJ) analysis incorporated in the MEGA 7 program (version 7.0.26, Pennsylvania State University, State College, PA, USA) (Kumar et al. 2016). Nucleotide-sequence divergence was calculated using the Kimura-2-parameter model, and the bootstrap support values for the nodes were obtained from 1000 replicates (Felsenstein 1985). The amount of accumulated intracellular oil in yeast NG17 was analyzed by two-stage fermentation (Ryu et al. 2013), where the cell growth and lipid accumulation are separated due to their different in nutrition requirements. In the first stage (cell growth), one loopful of yeast NG17 was grown in 50 mL of YM broth at 30 °C and 200 rpm for 24 h. Then, 5-mL of the resultant culture was further transferred into 45 mL of YM broth and incubated under the same condition for 48 h. The cells were harvested by centrifugation (4 °C, 9820 g, 10 min) and washed with distilled water. 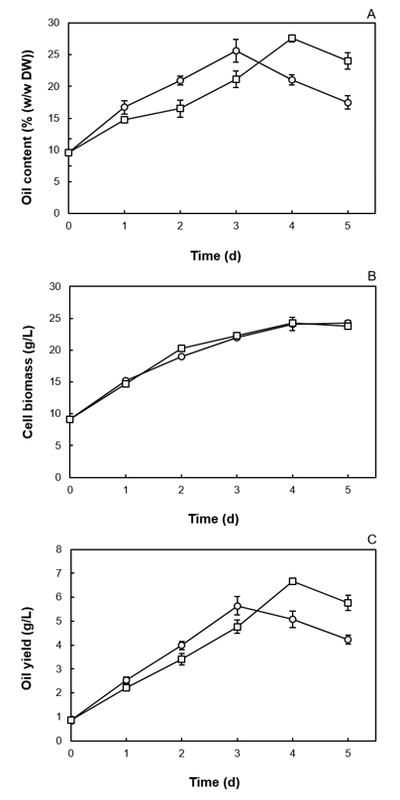 For the second stage (lipid accumulation), the washed cells were resuspended in 50 mL of the high C/N medium and incubated in the same manner given above for the indicated time (0 to 6 d). The cells were then harvested by centrifugation, washed with distilled water and dried via lyophilization. The amount of accumulated intracellular oil was analyzed as reported (Folch et al. 1957). In brief, the dried cells (0.5 g) were suspended in 10 mL of a 2:1 (v/v) chloroform: methanol mixture, sonicated at 37 kHz (15 min), and then 4 mL of 0.73% (w/v) NaCl was added to give a final 2:1:0.8 (v/v/v) chloroform: methanol: water mixture. After phase separation by centrifugation at 4 °C and 614 g for 10 min, the oil-containing lower phase was harvested and the solvent was removed via evaporation at room temperature to leave only the oil. Lipomyces starkeyi JCM 5955, a known oleaginous yeast strain, was treated in the same manner and used as the positive control. The oil was extracted and transesterified as reported (Anamnart et al. 1998). In brief, 1 g of cells was suspended in 0.8 mL of 10% (w/v) KOH in methanol at 80 °C for 2 h. After cooling to room temperature, the suspension was extracted with 1 mL of petroleum ether to separate the unsaponified materials and then centrifuged. The aqueous phase was harvested, acidified using 3 mL of 6 N HCl, and extracted with diethyl ether. The diethyl ether phase was harvested and the fatty acids were recovered by solvent evaporation with nitrogen gas and then transmethylated with boron trifluoride. The obtained fatty acid methyl esters were further extracted with hexane and analyzed by gas chromatography (GC; 7890 B, Agilent Technologies, Santa Clara, CA, USA) using a capillary column (0.32 mm × 30 m, 0.25 µm thickness) and flame ionization detector. The injection and detection temperatures were 150 °C and 250 °C, respectively, and helium was used as the carrier gas at a flow rate of 2.3 mL/min. The temperature program was an initial temperature of 150 °C and then sequentially increased to 180 °C at 10 °C/min, 200 °C at 5 °C/min, 205 °C at 0.5 °C/min, held at 205 °C for 2 min, and finally increased to 250 °C at 5 °C/min and held for 5 min (33-min total runtime) (Limsuwatthanathamrong et al. 2012). Sugarcane leaf particles were suspended at 6% and 12% (w/v) in 1.5% (w/v) H2SO4 and autoclaved at 121 °C and 103 kPa for 30 min. The resultant slurry (pretreated sugarcane leaves suspended in pretreatment hydrolysate) was adjusted to pH 5.0 and further hydrolyzed with 2,500 carboxymethyl cellulose (CMC) U/g AccellulaseTM1500 (Genencor International Inc., New York, NY, USA) at 50 °C and 125 rpm for 6 h. The solid residue was then removed by stainless-steel mesh filtration and centrifugation (4 °C, 9820 g and 20 min) to leave the SLH supernatant. The supernatant was harvested, adjusted to pH 5.5, and filter-sterilized through a 0.22-μm membrane filter. The SLH produced at the 6% and 12% (w/v) loading levels are referred to as SLH-6% and SLH-12%, respectively. The SLH-12% was detoxified by adjusting the pH to 10.0 with Ca(OH)2 at 50 °C for 30 min with mixing at 125 rpm (Yu et al. 2011). The mixture was then clarified by centrifugation (4 °C, 9820 g and 20 min) and the detoxified SLH-12% (DSLH-12%) supernatant was harvested, adjusted to pH 5.5 and filter-sterilized through a 0.22-μm membrane filter. Yeast NG17 was produced using two-stage fermentation, as described above except using SLH-6% containing 0.3% (w/v) peptone and 0.3% (w/v) yeast extract for cell propagation in the first stage and SLH-12% for lipid production in the second stage. The glucose and xylose concentrations were analyzed using a biochemistry analyzer (YSI 2700 Select, YSI Incorporated, Yellow Springs, OH, USA), while analysis of the furfural and HMF levels was performed via high-performance liquid chromatography (HPLC) using a Varian C18 column (250 x 4.6 mm) and UV detector (285 nm) (Agilent Technologies, Santa Clara, CA, USA). A 22:3 (v/v) ratio of acetic acid: methanol solution was used as the mobile phase at a flow rate of 1.0 mL/min. The column temperature was 25 °C (Bhatia et al. 2017). The total nitrogen content was analyzed by the Kjeldahl method (Bradstreet 1954). Colonies of yeast NG17 were circular, cream-coloured, butyrous, and raised with a smooth surface and an entire margin. Cells were ovoid or ellipsoidal (1 to 2 x 1.5 to 2.5 mm), occurred alone or in pairs with apical budding (Supplementary Information (SI), Fig. S1A), and consisted of elongate cells and pseudohyphae with blastoconidia (Fig. S1B, SI). Psuedohyphae with blastoconidia were formed on corn meal agar (Fig. S1C, SI). Ascospore was not observed. Glucose was not fermented. D-glucose, galactose (weak), L-sorbose, sucrose, D-maltose, D-cellobiose, D-trehalose, D-melezitose (slow), soluble starch (weak), D-xylose, ethanol, glycerol, ribitol, D-manitol, D-glucitol, salicin, Glucono-δ-lactone, succinic acid, citric acid (weak), D-gluconic acid, N-acetyl-glucosamine, and n-hexadecane were assimilated, while lactose, melibiose, raffinose, inulin, L-arabinose, D-arabinose, D-ribose, L-rhamnose, erythritol, galactitol, α-methyl-D-glucoside, 2-keto-gluconic acid, 5-keto-gluconic acid, lactic acid, inositol, D-glucuronic acid, D-galacturonic acid, methanol, D-glucosamine, D-glucurono lactone, L-arabitol, quinic acid, saccharic acid, propylene glycol, xylitol, butane-2,3-diol, xylo-oligosaccharide, and n-decane were not assimilated. It assimilated ethylamine hydrochloride, lysine hydrochloride, and cadaverine dihydrochloride but did not assimilate ammonium sulfate, potassium nitrate, sodium nitrite, creatine, creatinine, D-glucosamine and imidazole. Growth at 25, 30, 35 and 37 °C were positive but at 40 °C was negative. Growth in 0.01 and 0.1% (w/v) cyclohexamide and vitamin free medium were negative. Acetic acid and gelatinase were produced. Growth on 1% (v/v) acetic acid was negative. Urease activity was positive. Arbutin spitting was negative. Growth in 10% (w/v) NaCl plus 5% (w/v) glucose medium and 16% (w/v) NaCl plus 5% (w/v) glucose medium were negative. Growth on 50 and 60% (w/v) glucose agar were negative (Table S1, SI). Analysis of the 26S rRNA (D1/D2) sequence revealed that yeast NG17 was closely related (88 to 87% similarity) to Candida ghanaensis, with 10.2% divergence of 353 nucleotides (nt) (42 nt substitutions, six gaps), C. pseudointermedia by 8.86% divergence of 350 nt (45 nt substitutions, 14 gaps), and C. intermedia by 8.57% divergence of 350 nt (44 nt substitutions, 14 gaps) (Table S2, SI). According to Kurtzman and Robnett (1998), yeast strains with a 26S rDNA (D1/D2 domain) sequence difference of 1% or greater are designated as a different species. In addition, the NJ phylogenetic analysis, based on the 26S rDNA (D1/D2 domain) sequences (Fig. S2, SI), showed that the yeast NG17 was placed in an unaffiliated Saccharomycetales (Saccharomycetes, Ascomycota) clade near Candida digboiensis, Candida blankii, and Candida ghanaensi. Based on these results, yeast MOTU NG17 was ascribed to the Candida genus, but not species level, as Candida sp. NG17. The GenBank/EMBL/DDBJ accession number for the sequence of the D1/D2 domain of the 26S rRNA gene of Candida sp. NG17 is LC431284. The oil from Candida sp. NG17 grown in the high C/N medium was transesterified and analyzed by GC. The major fatty acids of the oil were oleic (C18:1), palmitic (C16:0), stearic (C18:0), and linoleic (C18:2) acids at 57.6, 25.4, 8.08, and 5.32%, respectively. These were also reported to be the dominant fatty acids in the oil from Trichosporon sp., Pseudozyma parantarctica and Cryptococcus curvatus grown in glucose containing medium (Brar et al. 2017; Areesirisuk et al. 2015; Yu et al. 2014). The level of oil that accumulated in Candida sp. NG17 was evaluated after two-stage fermentation using enriched SLH-6% and SLH-12% as the media. The glucose, xylose, total nitrogen, furfural, and HMF concentrations in the SLH-12% and DSLH-12% are shown in Table 2. The oil content, cell biomass and oil yield of Candida sp. NG17 were 10.2% (w/w, DW), 22.7 g/L and 2.3 g/L, respectively, when grown in SLH-12% for 6 d.
The influence of SLH detoxification on the oil accumulation by Candida sp. NG17 was examined by comparison of the obtained oil yield when grown in SLH-12% or DSLH-12%. Candida sp. NG17 had a higher oil yield when grown in SLH-12% (2.3 g/L) than in DSLH-12% (2.1 g/L) at pH 5.5. While there was no remarkable difference in the furfural and HMF concentrations between the SLH-12% and DSLH-12%, the glucose and xylose concentrations were lower in DSLH-12% than in SLH-12% (Table 2). This reduction in the C/N ratio of DSLH-12% might have been the cause of the lower oil accumulation in Candida sp. NG17. Rhodotorula glutinis had a higher oil yield in acid-treated CCH, which contained higher levels of HMF 0.48 g/L, furfural 0.17 g/L, and acetic acid 5.79 g/L, than in the Ca(OH)2-detoxified CCH. However, there was a reduction in the glucose and xylose concentrations of 14.1 and 18.2%, respectively, during the detoxification process (Liu et al. 2015). In the acid-treated wheat straw hydrolysate (WSH), which contained HMF 0.44 g/L, furfural 0.05 g/L, and acetic acid 4.0 g/L, Cryptococcus curvatus, Rhodotorula glutinis, Lipomyces starkeyi, and Yarrowia lipolytica all had a higher oil yield than in the Ca(OH)2-detoxified WSH. The concentrations of glucose, xylose, arabinose, and galactose in the detoxified WSH were 13.5, 28.6, 21.3, and 33.3%, respectively, lower than in the WSH (Yu et al. 2011). 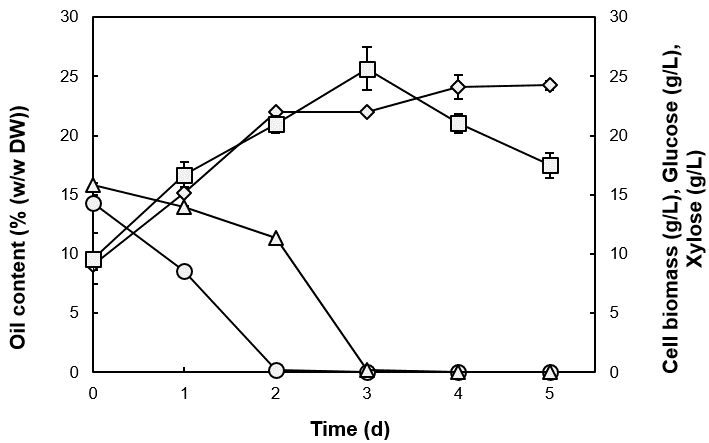 Oil accumulation in Trichosporon fermentans grown in acid-treated rice straw hydrolysate (RSH) and the Ca(OH)2-detoxified RSH was compared. When the Ca(OH)2-detoxified RSH was concentrated by vacuum evaporation, to increase the concentrations of glucose, xylose, and arabinose by 3.0-, 3.3- and 3.7-fold, respectively, it was found that T. fermentans had a higher oil yield in the Ca(OH)2-detoxified RSH than in the RSH (Huang et al. 2009). The effect of increasing the pH from 5.0 to 6.5 in the SLH-12% on the oil accumulation in Candida sp. NG17 was investigated. The highest oil content, 21.0% (w/w DW), cell biomass (24.1 g/L) and oil yield (5.07 g/L) were all obtained after 3 d at pH 6.5 (Fig. 1). The initial pH of the medium is known to impact the resulting oil yield and cell biomass of oleaginous yeast strains (Ryu et al. 2013). Candida sp. NG17 utilized glucose and xylose simultaneously, but the glucose was utilized faster, and the rate of xylose use then increased after the glucose was exhausted. (Fig. 1). In accord, Rhodosporidium kratochvilovae HIMPA1 utilized glucose, fructose, and sucrose simultaneously during the accumulation of intracellular oil but utilized glucose faster than the other sugars in the first 48 h (Patel et al. 2015a). However, Lipomyces starkeyi AS 2.1560 utilized glucose and mannose simultaneously for oil accumulation (Yang et al. 2014). Compared with the high C/N medium, the oleic and palmitic acid contents in the oil from Candida sp. NG17 grown in SLH-12% were reduced from 57.6% to 48.5% and from 25.4% to 22.1%, respectively (Fig. 2). The type of raw material used as a substrate is known to significantly influence the fatty acid composition of the obtained oleaginous yeast oil (Brar et al. 2017). Fig. 1. Oil accumulation and biomass of Candida sp. NG17 in SLH-12% (pH 6.5) and the culture medium sugar content: oil content ( ), cell biomass ( ), glucose ( ) and xylose ( ). Data are shown as the mean ± 1SD, derived from three independent repeats. Fig. 2. 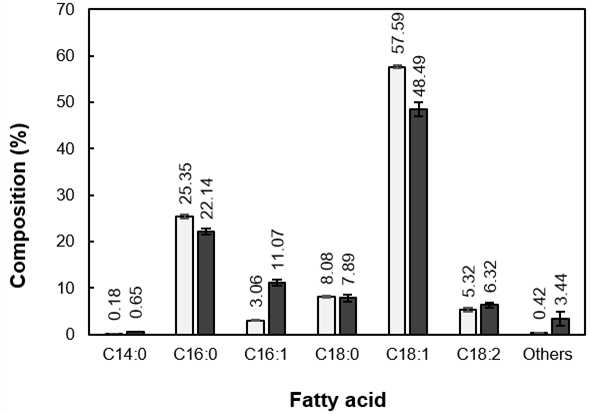 Comparison of the fatty acid composition of the oil accumulated in Candida sp. NG17 when grown in the high C/N medium ( ) and SLH-12% ( ). Data are shown as the mean ± 1SD, derived from three independent repeats. The major fatty acid composition of the Rhodosporidium kratochvilovae HIMPA1 oil was oleic (45.4%), palmitic (21.9%), and linoleic (15.9%) acids when grown in the effluent from the pulp and paper industry (Patel et al. 2017). However, the fatty acid composition changed to principally contain palmitic (43.1%), stearic (28.7%) and oleic (17.3%) acids when grown in Cassia fistula L. fruit pulp water extract (Patel et al. 2015b). The dominant fatty acid composition of palm oil was reported to be oleic (C18:1, 47.9%), palmitic (C16:0, 20.4%), and stearic (C18:0, 10.3%) acids (Liu et al. 2015), while that in canola oil was oleic (C18:1, 63.3%) and linoleic (C18:2, 19.6%) acids (Orsavova et al. 2015). Their high proportion of C16 and C18 fatty acids makes them favorable as a raw material for biodiesel production (Kolouchova et al. 2016). Since the oil from Candida sp. NG17 also had a high proportion of C16 and C18 fatty acids, similar to palm and canola oils, then the oil of Candida sp. NG17 grown in SLH-12% has the potential to be used as a raw material for biodiesel production. In addition to the loss of soluble sulphate (as CaSO4), soluble phosphate was also removed from the SLH during its Ca(OH)2-mediated detoxification to DSLH (Wu et al. 2010). Phosphorus is important for yeast growth and metabolism, while, in addition, the intracellular oil in oleaginous yeasts is stored in a specific cell compartment encased with a phospholipid monolayer as an oil droplet (Qin et al. 2017), where phosphorus is an essential factor in phospholipid synthesis. Thus, phosphate deficiency might have been another reason for the lower level of oil accumulation and lower cell biomass obtained when Candida sp. NG17 was grown in DSLH-12% compared with that in SLH-12%. As the DSLH-12% had a different C/N ratio from the SLH-12%, a direct comparison of the oil accumulation obtained when grown in DSLH-12% or SLH-12% as an effect of phosphate reduction could not be performed. Instead, the oil accumulation in Candida sp. NG17 grown in SLH-12% with and without phosphate supplementation was evaluated. In SLH-12% (pH 6.5) supplemented with 0.1% (w/v) KH2PO4, the oil content, cell biomass and oil yield of Candida sp. NG17 increased from 21.0% to 27.6% (w/w DW), 24.1 g/L to 24.3 g/L and 5.07 g/L (at 3 d) to 6.67 g/L (at 4 d), respectively, with the same oil productivity (0.2 g/L/d) as in SLH-12% without phosphate supplementation (Fig. 3). Thus, the SLH requires phosphate supplementation in order to increase the oil accumulation in Candida sp. NG17. The newly isolated oleaginous yeast NG17 was identified as Candida sp. NG17. Candida sp. NG17 gave a higher oil yield in SLH-12% than in DSLH-12%. Intracellular oil yield of Candida sp. NG17 grown in SLH-12% (pH 6.5) was 5.07 g/L at 3 d.
The oil yield increased to 6.67 g/L at 4 d when the SLH-12% was supplemented with 0.1% (w/v) KH2PO4 (oil productivity of 0.2 g/L/d). Fatty acid composition of Candida sp. NG17 oil grown in SLH-12% was oleic (C18:1), palmitic (C16:0) and palmitoleic (C16:1) acids at 48.5, 22.1 and 11.1%, respectively. This study was financially supported by the Thai Government Research Fund (Fiscal year 2017) and the Graduate School Chulalongkorn University to commemorate the 72nd anniversary of his Majesty King Bhumibala Adulydeja and the 90th anniversary Chulalongkorn University Fund (Ratchadaphiseksomphot Endowment Fund). Folch, J., Lees, M., and Sloane-Stanley, G. (1957). “A simple method for the isolation and purification of total lipid from animal tissues,” J. Biol. Chem. 226, 497-509. Hall, T. A. (1999). “Bioedit: A user-friendly biological sequence alignment editor and analysis program for windows 95/98/nt,” Nucl. Acid. S. 41, 95-98. Kurtzman, C. P., Fell, J. W., Boekhout, T., and Robert, V. (2011). “Methods for isolation, phenotypic characterization and maintenance of yeasts,” in: The Yeast, A Taxonomic Study, 5th Ed., C. P. Kurzman, J. W. Fell, and T. Boekhout (eds. ), Elsevier, San Diego, CA, Vol.1, pp. 105-106. Kurtzman, C. P, and Robnett, C. J. (1998). “Identification and phylogeny of ascomycetous yeast from analysis of nuclear large subunit (26S) ribosomal DNA partial sequences,” Antonie van Leeuwenhoek 73, 331-371. Office of the Cane and Sugar Board (2017). “Annual report 2016,” (http://www.ocsb.go.th/th/cms/index.php?SystemModuleKey=journal), Accessed 25 Nov 2017. Ratledge, C. (1989). “Biotechnology of oils and fats,” in: Microbial Lipids, C. Ratledge and S. G. Wilkinson (ed. ), Academic Press, London, Vol.2, pp. 567-668. TAPPI T211 om-12 (2012). “Ash in wood, pulp, paper and paperboard: Combustion at 525 °C,” TAPPI Press, Atlanta, GA. Article submitted: July 21, 2018; Peer review completed: October 11, 2018; Revisions accepted: December 11, 2018; Published: December 12, 2018. Fig. S1. Morphological characteristics of Candida sp. NG17. Cells and budding cells grown in YM broth at 25 °C for 7 d (A). Pseudohyphae with blastoconidia when grown in YM broth at 25 °C for 7 d (B). Pseudohyphae with blastoconidia on corn meal agar film sandwiched between glass slide and cover glass at 25 °C for 7 d (C). Bars 10 μm. Images shown are representative at least 10 such images per sample and two independent samples. Fig. S2. Phylogenetic tree based on the NJ analysis of 26S rDNA (D1/D2) gene sequences, showing positions of Candida sp. NG17 and the related ascomycetous yeasts. Bootstrap values ≥ 50%, determined from 1000 replicates, are shown at branch nodes. Each of the Yarrowia, Clavispora and Metschnikowia clades is represented. Schizosaccharomyces pombe was used as the outgroup species for this analysis. GenBank accession numbers are given in parentheses. T = type strain, NT = neotype strain. 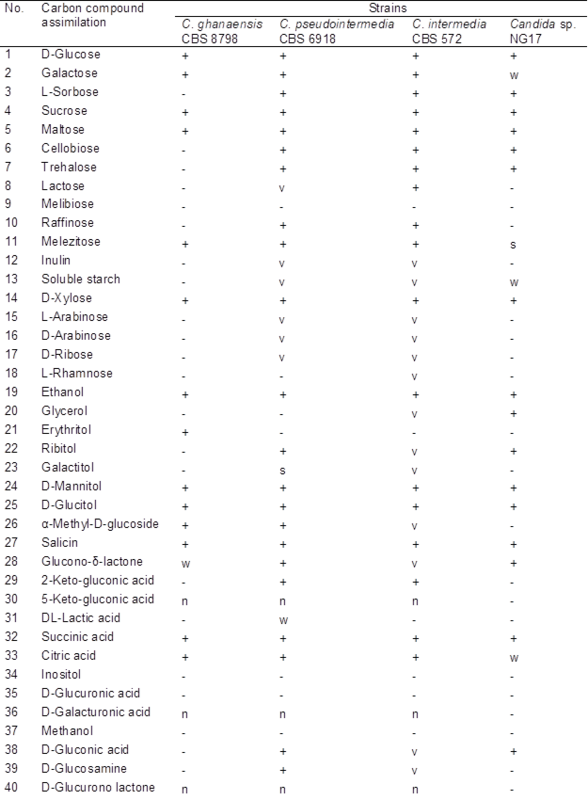 Bar, 0.02 changes per position.